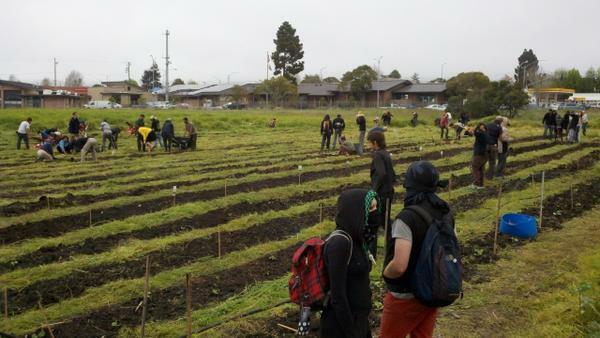 This afternoon at 3 p.m., nearly 300 Albany residents entered a piece of property owned by the University of California called the Gill Tract, and took it over as a renegade urban farm. The protesters there are planning to remain at the property, and request donations of tents and other supplies to build their encampment. The plot of land, at the corner of Buchanan Street and San Pablo Avenue directly across from the Albany Police Headquarters, is currently set to be sold off and privatized as a location for a new Whole Foods store. These Albany residents want the land, currently an open field, to be used as a community farm. The Occupy movement has long stood in solidarity with farmers and agricultural workers who are leading the struggle for food justice. Groups like Occupy Vacant Lots in Philadelphia work toward creating community-based, community-controlled alternatives to the corporate food system. Guerrilla gardening is a direct attack on corporate control of land and food, two basic human rights that belong to the people and should not be used for the exclusive profit of greenwashed corporations like Monsanto or Whole Foods. By demonstrating we can freely take care of ourselves through direct action and mutual aid on our own terms, we are not only growing our own food – we are planting the seeds for a new, more just model for organizing the world. See below for the full Occupy The Farms Press Release. *The Gill Tract is located at the Berkeley-Albany border, at the intersection of San Pablo Ave and Marin Ave.
*Join us: Come dressed to work! We need people to help till the soil, plant seedlings, teach workshops, and more. *Donate/lend: We need shovels, rakes, pickaxes, rototillers, drip irrigation tape, gloves, hats, food, and anything else farming related! Even if you don’t love gardening, digging in the dirt may be good for your health — and it has nothing to do with a love of nature or the wonder of watching things grow. The secret may be in the dirt itself: A bacteria called Mycobacterium vaccae that acts like an antidepressant once it gets into your system. Seven sloping acres at the southwest edge of Jefferson Park is being transformed into an edible landscape and community park that will be known at the Beacon Food Forest, the largest of its kind in the nation. For the better part of a century, the land has languished in the hands of Seattle Public Utilities. That will all change this spring. One full acre will be devoted to large chestnuts and walnuts in the overstory. There’ll be full-sized fruit trees in the understory, and berry shrubs, climbing vines, herbaceous plants, and vegetables closer to the ground. Sepp Holzer, a man who not only produces food in a very unlikely location, at a high and frigid altitude in Austria, but is also growing very unlikely crops there as well — and all without the use of chemicals, and with minimal input of human labour. I guess you could call him a European counterpart of people like Bill Mollison and Masanobu Fukuoka — as all three independently discovered ways of working with nature that save money and labour and that don’t degrade the environment, but actually improve it. In Holzer’s case, he was effectively running a permaculture farm for more than two decades before he even realised his unconventional approach could be termed ‘permaculture’.